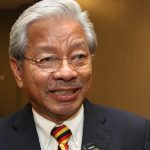 KUCHING: Deputy Chief Minister Tan Sri Datuk Amar Dr James Jemut Masing said today that politicians should just ride on MAS Airlines and not interfere with its management. “Let the professionals handle it,” he added. He was commenting on an announcement by Prime Minister Tun Dr Mahathir Mohamad earlier today that several parties had expressed interest in purchasing the ailing national airline. Dr Mahathir added that the government was still looking into the viability of selling off the company as one of the ways to save it from mounting losses. Masing pointed out that Malaysia Airlines Berhad (MAS) was a symbol of Malaysian pride and selling it was akin to selling country’s symbol and pride. He said he was very sure Malaysians could manage the airline and that capable people with managerial skills would know what to do. “If AirAsia can do it, I do not see why MAS cannot recruit capable people among the 30 million Malaysians,” added Masing. ‘Just ride on MAS, don’t interfere with its management’ 0 out of 5 based on 0 ratings. 0 user reviews.